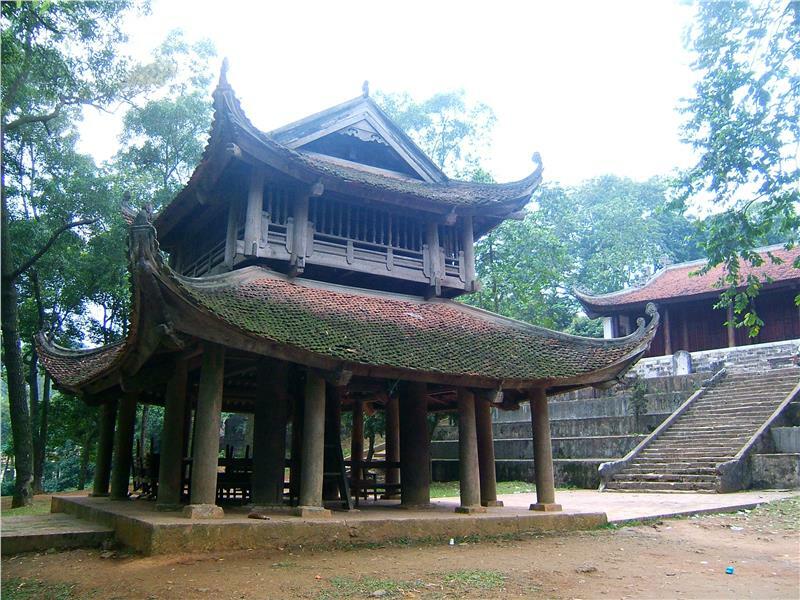 Tram Gian Pagoda (literally One Hundred Compartment Pagoda), also known as Quang Nghiem Pagoda is located in Tien Lu Village, Tien Phuong Commune, Chuong My District, Hanoi. Far about 20 kilometers from Hanoi city center, this pagoda with 104 compartments is one of the most ancient pagodas in Vietnam. The pagoda was built in the 12th century under Ly Dynasty. Its roof was built on the great number of wooden pillars. If 4 pillars form one compartment, the pagoda retains more than a hundred compartments. It is the reason why the locals often call the pagoda Tram Gian Pagoda (One Hundred Compartment Pagoda). Thanks to its extremely unique design, Tram Gian Pagoda has long become one of the famous pagodas in Hanoi attracting numerous tourists. The pagoda has been renovated several times. The architectural ensemble here can be divided into 3 clusters. The first one consists of two houses right on the entrance into the pagoda. The second one is the 2-storey bell tower with 8 roofs built in 1693. The rest includes the worshiping hall and upper sanctum. From the three-gate entrance - steeple through the narrow courtyard, tourists will set foot on the pagoda's courtyard. Stepping up 7 stone stairs more, tourists will reach the pagoda's patio or run along the corridor on the left to enter the inner courtyard of the pagoda with the extra housing area (guest house and monk rooms...) and then get in Jewels behind the apse. The central area of the pagoda is the harmonious combination of forecourt and upper sanctum with each other creating the unified interior. In addition, the long corridor on both sides connecting with the forecourt in front and apse behind forming the closed architecture. Discovering Tram Gian Pagoda is definitely one of the most unforgettable things to do in Hanoi. Behind the apse on the left is home to living quarters of the monks built later than other architectural works. Surrounding the pagoda is green campus, which houses nearly 30 pine trees of more than hundreds of years. Two sides of courtyard at forecourt retain the walkway down the tower garden with dozens of mossy graves flickering under the shade of old trees halfway up the hill. They all seem to increase the tranquility for the pagoda. Tram Gian Pagoda is designed under the architecture of worshiping Buddha in front and Saint behind. Together with worshiping Buddha, the pagoda is home to worship Saint Nguyen Binh An, which expresses the religious interference between the belief of the nation with the development of history. 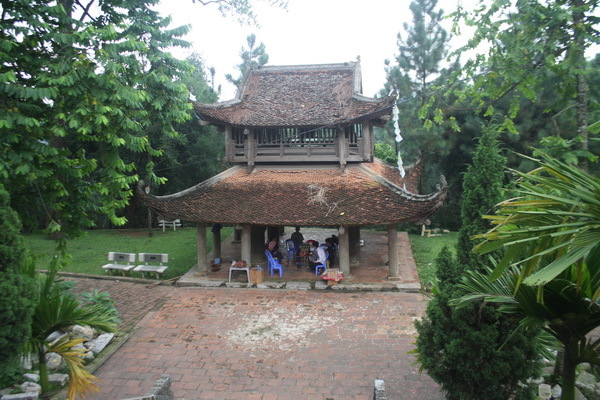 Along with the system of unique Hanoi pagodas, Tram Gian Pagoda is one of the tourist sites tourists should not miss when experiencing Hanoi travel. In particular, the main pagoda still hangs a large drum 1m in diameter molded by the end of Le Dynnasty (1749). 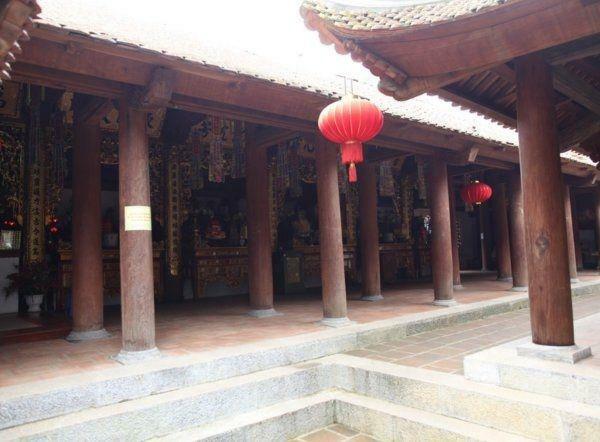 Furthermore, there are many steles, horizontal lacquered board and parallel sentences... inside the pagoda. Especially, 2 mosaic parallel sentences are regarded to be appeared from Ho Dynasty (1400-1406). 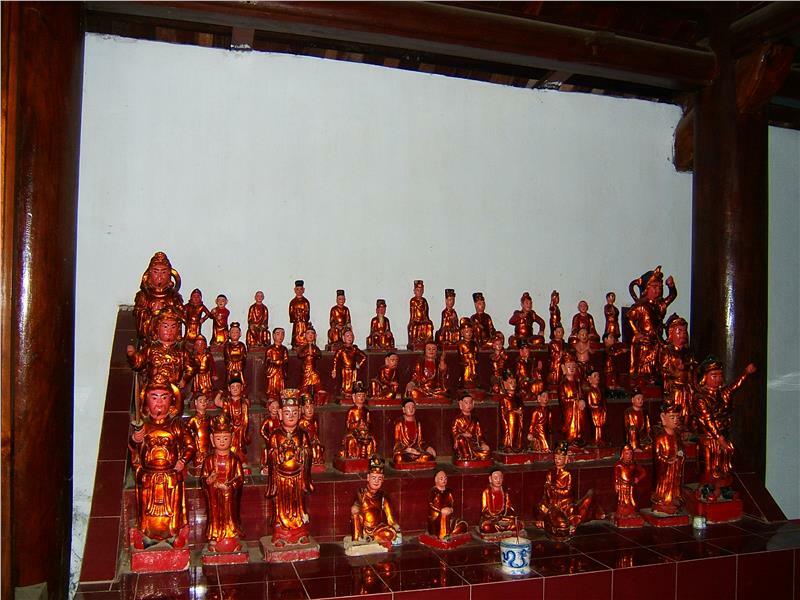 The pagoda is home to 153 statues, mostly made of wood and a few made of terracotta. 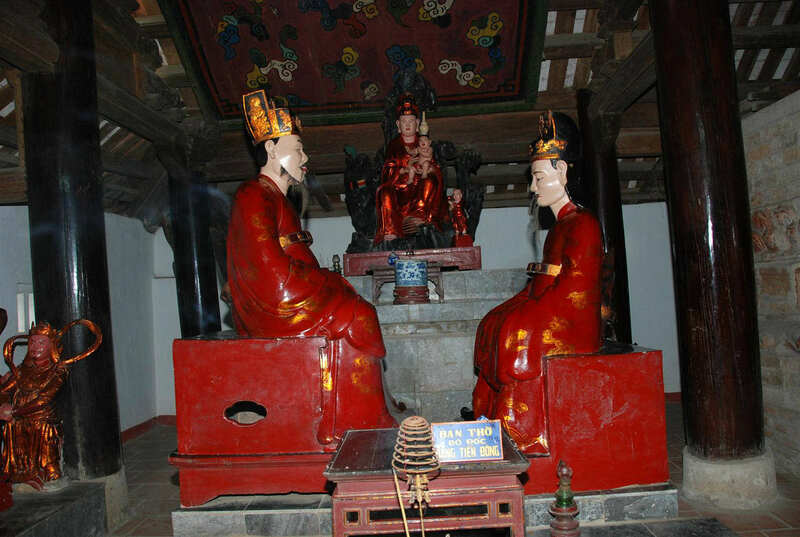 The most prominent and precious is the statues of Buddha and Avalokitesvara Bodhisattva. It is extremely precious antiques that contribute to promote Tram Gian Pagoda to become one of the fascinating Hanoi attractions. Besides, in the middle of an upper sanctum is the red terracotta rectangular-shaped altar, which is supposedly made from Tran or Mac Dynasty. There is the lotus pedestal on the altar which house the statues of Buddha. The pedestal is decorated with numerous motifs of animals and flowers, four corner of which is patterns of Garuda birds. 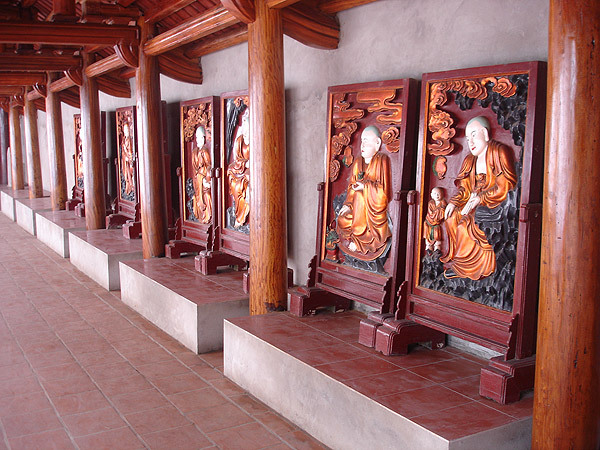 Along both sides of the corridor is reliefs of 18 Arhat sophisticatedly carved on wood. It is the unique architecture that has brought Tram Gian Pagoda to become one of the most tourist attractions in Hanoi yearly alluring numerous tourists. The pagoda was recognized as national cultural historical relics by Ministry of Culture - Information. Visiting Tram Gian Pagoda, tourists will have a chance to immerse in the green of the pine, of the dracontomelum and the faded red tile over time. The tranquil space will definitely leave unforgettable impressions in the hearts of tourists. The towering ancient pine trees, the curved roofs along with the fragrant flavor of lotus will be excellent experiences when tourists once set foot on the ancient pagoda.